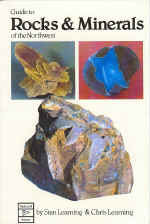 Description: This guide is intended to show some of the much-prized rocks and minerals of the Northwest. Some are valued for their beauty when cut and polished. Others are prized for the economic value of the metals they contain, such as copper in chalcopyrite, or of some physical property of the mineral itself, such as the fibrous nature of asbestos. Still other minerals are valued for their crystal form, or simply as examples of the great diversity in the mineral kingdom.